In the 19th century, lot of American women started making quilts in their early age dreaming of marriage. Women used to receive series of fabric gifts from their family and friends since young age as belongings of the bride in the future. 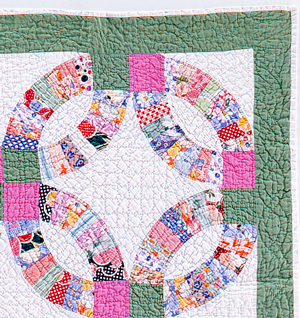 Although there are some myths floating around about the double wedding ring quilts, it was believed that double wedding ring quilts were formed with those series of gifts and by single women dreaming about getting married someday. 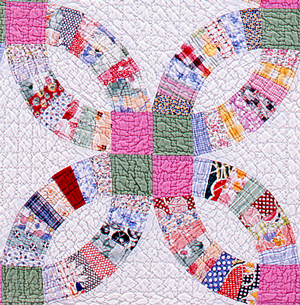 The interlocking circles of the quilt are considered to express wedding rings, the symbol of marriage. Some say double wedding ring quilts were also made for departing a new life. Those light and refreshing colors might be a reflection of the dream color and freshly married life. 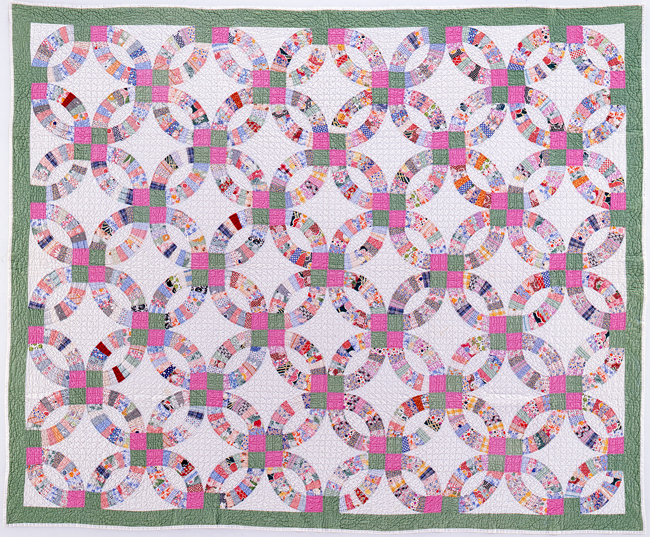 This quilt was beautifully formed with romantic colors, pink and peppermint green of interlocking ring.